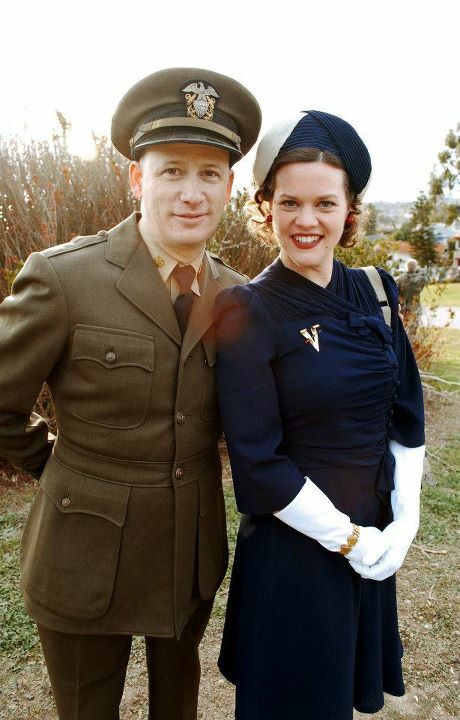 We’re back from an annual WWII fundraiser dance for the Fort MacArthur Military Museum! The Great Los Angeles Air Raid is probably my favorite vintage event of the year, and this year was no exception. There was quite an impressive array of military displays and vehicles present, as well as several vintage cars (my husband and I drove up in his ’39 Plymouth), and a great swing dance and firework show. 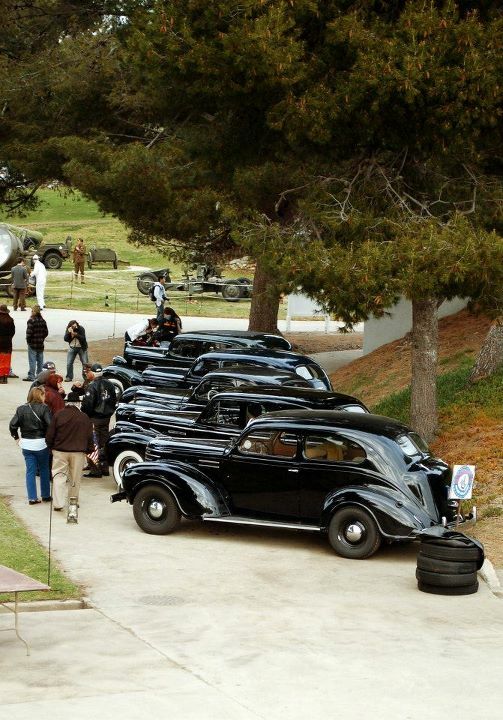 This event pays homage to the Battle of Los Angeles, a 1942 event that is still under much debate. Was it a weather balloon? Was it a UFO? Whatever your stance, the event is great fun and the proceeds all go to the museum. The lineup of vintage cars. My husband wore a vintage sailor uniform to the event this year. 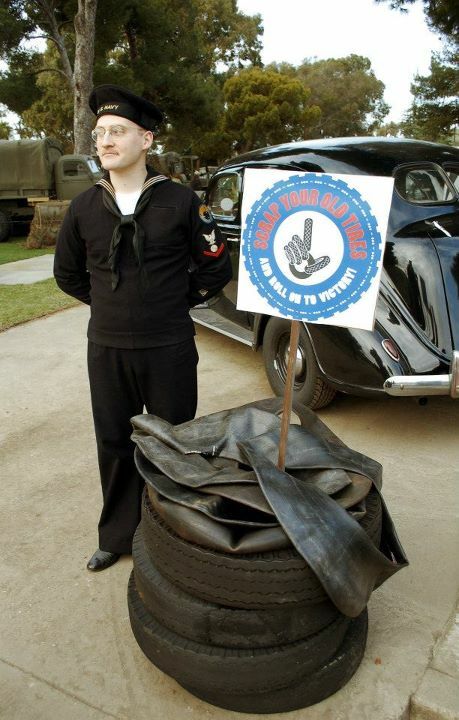 He had these tires for a friend to pick up for his old car, so cleverly devised a way to drop off the tires AND add to the wartime ambiance. 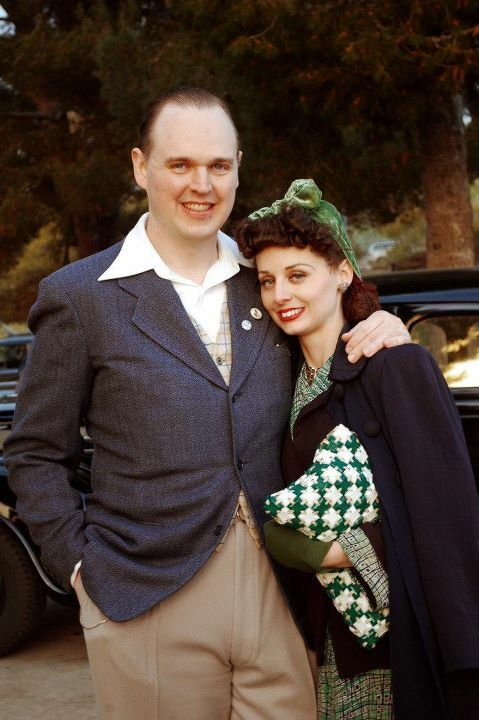 The newly engaged couple, Rob and Ashley of Miss1940sVintage on Etsy. Josh Curtis, author of Sunkissed, with Beth from V is for Vintage blog. 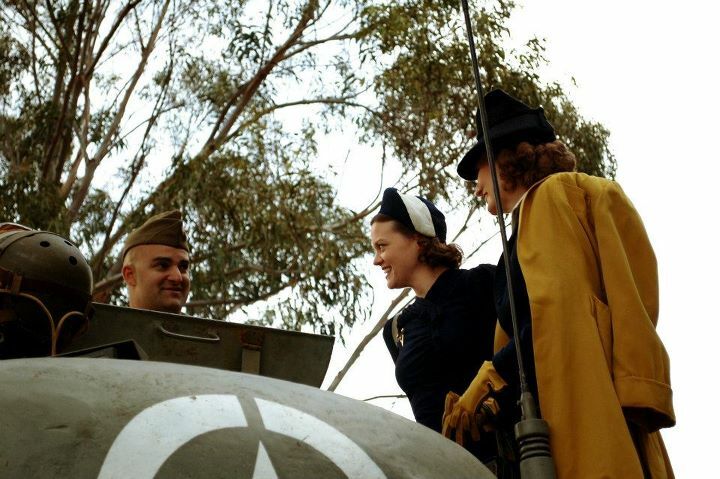 Beth and I posing on top of a Sherman tank. How cool is it that we got to climb on top of this monster thing? The re-enacting unit that brought it drove it around quite a bit and it was fun to watch, and we loved getting to check it out and walk on top of it. Checking out the inside of the tank and this gentleman answered some of our questions. It was really neat! 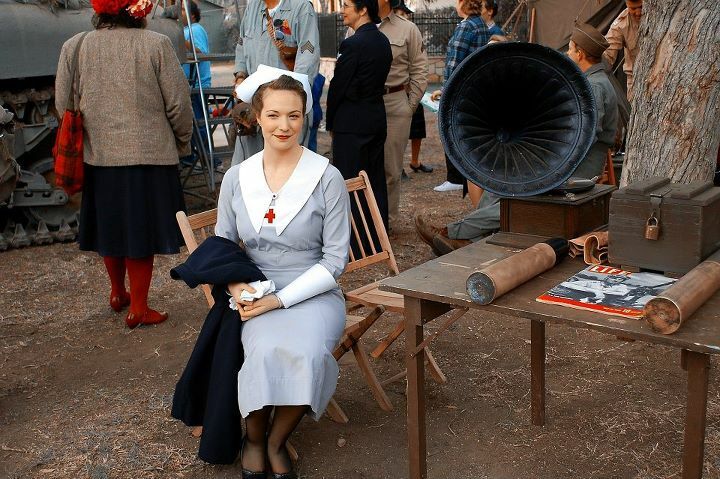 Kate in her awesome vintage nurse uniform. Love that phonograph! Me in my ensemble. I had no clue what I was wearing until that morning. I had great plans for making a patriotic ensemble, but ran out of time. The Air Raid gets notoriously cold for Los Angeles, so warmth was the ultimate goal! In a last minute hope to cobble together an outfit, I thrifted the shirt the day before the Air Raid. How did I not have a single basic 40’s white or ivory shirt? Added to my to-make list for sure! It’s a modern shirt but had a vintage looking collar shape, so I added vintage buttons to make it look more period. 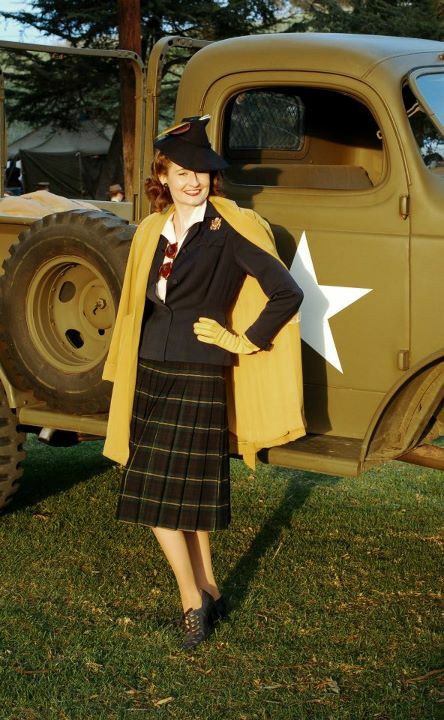 I wore a vintage wool skirt (part of a two-piece suit), vintage jacket (gift from a friend) with “V” pockets, mustard vintage overcoat and gloves, vintage shoes, and vintage hat which I added new feathers to match. We had a great time this year and are looking forward to next year’s event! So sorry to have missed it this year! It is always one of our favorites too. You guys looked amazing – no surprises there. Matt’s tire display is great! All of you look so fabulous! What a fun event! I loved your husband’s way of dropping off the tires! Brilliant! 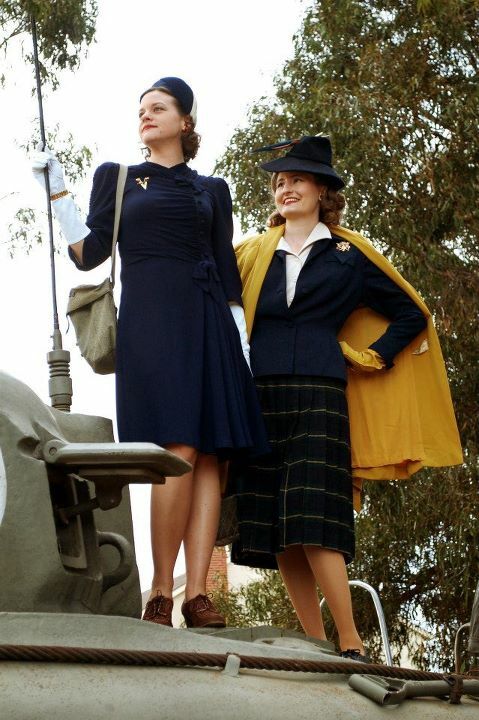 My goodness- how fab is your hat (very envious) and your coat is simply stunning. Fabulous outfit! You wear so beautifully this period! Wow! You all look amazing! Looks like such a fun event! This event looks like so much fun. I hope to attend it sometime. It was funny to see Josh Curtis all of the sudden while scrolling through your pictures. I haven’t seen him since about 1998, when we all used to hang out at the vintage shop in Yucaipa.